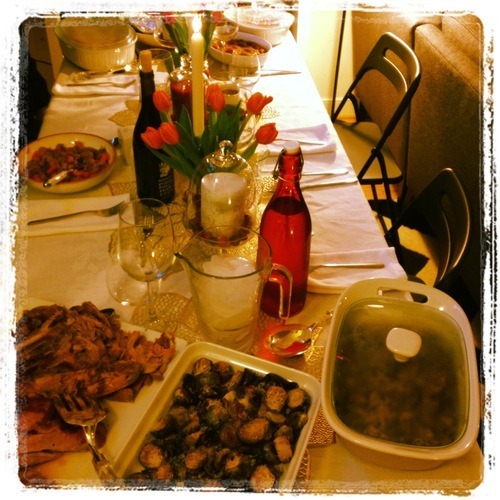 Preparing to host our first Thanksgiving kept us very busy this week. 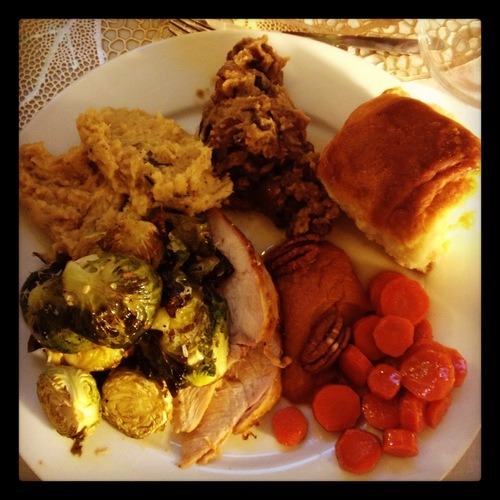 But now that it’s over – we survived and have a fridge full of leftovers – it was so worth it! Although, there was one moment when I wondered if we’d be able to get everything done. I spent all week getting the food, figuring out timing for how to get everything done on Thursday, cleaning, and setting up. None of that prepared me to have our sink stop draining, our disposal stop working, and our dishwasher start flooding at 11:30pm on Wednesday. After an hour of trying to fix it, we went to bed thinking we’d be doing all of our dishes in the shower on Thanksgiving. Luckily, Dave managed to fix it Thursday morning about five minutes before his parents showed up (side note, pour baking soda and vinegar, and then boiling hot water down the drain to clear the clog). But all in all, we had a pretty seamless day on Thanksgiving. I had wanted to do several posts with all of the different things I made (and lots of pictures) but I sort of underestimated how much I’d have to do on Thanksgiving. So I had to skip taking pictures of every step. But I do want to give you the links/recipes for all of my dishes, and some pictures of the final products! Turkey: Dave was in charge of the main dish, so I wasn’t as involved in this part of the meal. But I do want to share the recipe because it was amazing. He tried a new technique (roast and braise), and I have to admit, I was a bit skeptical when he showed it to me. This recipe involves presenting the turkey hours before the meal, which worried me, but the meat was cooked perfectly and I am definitely now converted to this method. You can find the recipe here. We had a bigger turkey (15 pounds) so we had to use more vegetables and stock, but otherwise we followed this recipe. Our turkey took about 2 hours and 10 minutes in the oven, 45 minutes on the stove for the dark meat, and then 10-15 minutes in the broiler. 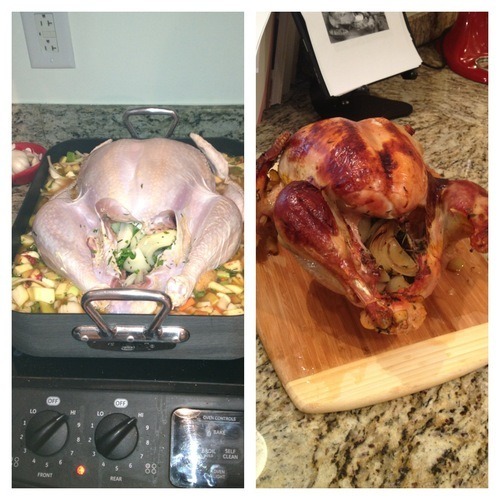 So all in all, for a 15 pound turkey it took us 3 hours and 10 minutes to cook our bird. I also recommend prepping all of the vegetables the night before. It seems like a small task, but we had all of the aromatics and veggies all prepped and ready to go, which saved a lot of time on Thanksgiving. See before and after below. Gravy: we used a recipe from the same site as our turkey, which you can find here. My only warning on this is that it takes longer than expected. We left this for the very end, which you have to do because you need the fat from the turkey, but just plan on it taking 20-30 minutes. Cranberry: I cheated on this one and bought the orange cranberry relish at Trader Joe’s, because it is delicious. 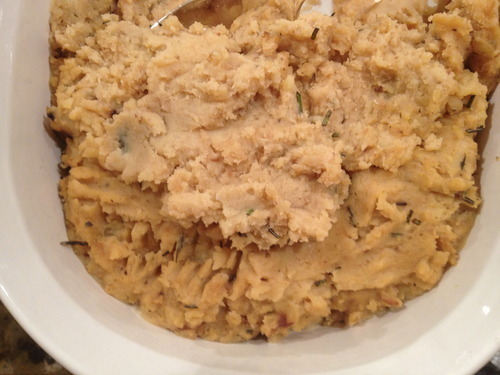 Fennel and Rosemary Mashed Potatoes: the potatoes are almost always my favorite part of Thanksgiving. But this year, they were even better than usual. The combination of the fennel and rosemary gave these potatoes such a great flavor. I highly recommend them. 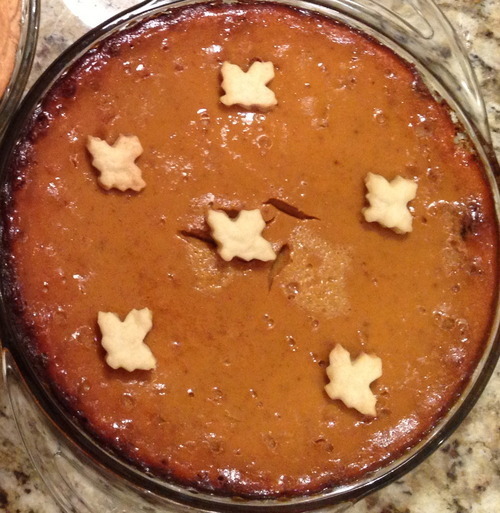 In fact, I might not wait till next Thanksgiving to make these again. You can find the recipe here. I also prepared the vegetables for this the night before. I pre-peeled the potatoes, and pureed the roasted fennel in my food processor. Rolls: I probably didn’t need these, but hey, I always have too much food. 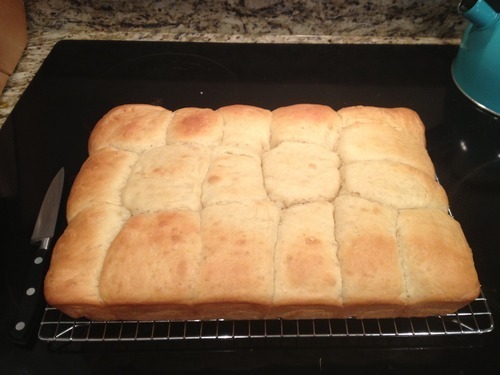 I used Martha Stewart’s basic dinner rolls recipe, which you can find here. These were great because you could also prepare them the night before, and then just bake them the day of. Sweet Potatoes and Stuffing: unfortunately, I don’t have the recipes for these because Dave’s mom made them, but I can say they were delicious. I think stuffing is interesting because every family has their own very unique stuffing. My family has done cornbread for years (and even quinoa one year) and Dave’s mom does Ritz crackers. Glazed Carrots: I used the Richardson family’s recipe and I have to say, these might have been one of the easiest things. The recipe only requires 1 pound of carrots, 2 tablespoons butter, and 1/2 cup packed brown sugar. After cutting the carrots (I did them in little circles), you simmer them, covered, in a small amount of boiling water for about 10 minutes or until tender. Then melt the butter and stir in the brown sugar until dissolved. Add carrots. Cook over medium low heat for about 10 minutes, stirring often. Serves 6. Roasted Brussel Sprouts: I didn’t follow a recipe for these. I just cut some brussel sprouts in half, mixed them with some olive oil, salt, and pepper, and then cooked them in the oven at 375 for 20-30 minutes. When they came out of the oven, I sprinkled them with some lemon juice and parmesan cheese. Very easy, and I did these right at the end. You can see the full spread I had on my plate below. Pumpkin Pie with Gingersnap Crust: my mom has been making her pumpkin pie the last couple years with a gingersnap crust, and so I wanted to do this as well. For the crust, I used this recipe. For the filling, I used the recipe that comes on the Libby’s pumpkin can. All very easy. I prepared the pie crust in the morning, and then cooked the pie while we were eating dinner. I like doing it this way because it forces you to take a break between dinner and dessert (much needed on Thanksgiving when you are eating so much). 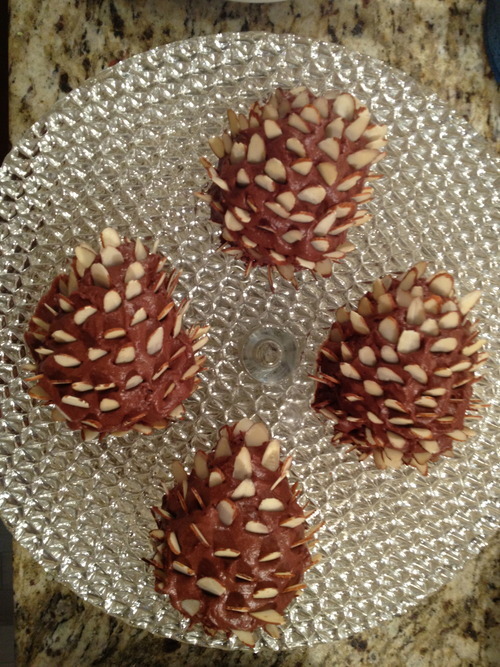 Pinecone Cakes: These were definitely the most popular/impressive item. I’m not going to lie, I even kind of impressed myself with these guys. You can find the recipe here. The cake and frosting itself are delicious. I’ve already had a friend request it for her birthday (NEXT JUNE), but the best part is how cool they look. They really do look just like pinecones. The only downside is that the decorating is very time consuming. I only needed four pine cones since it was just me, Dave, and his parents. So I only decorated 4, and then just frosted the rest to eat later. One tip, the shaved almonds I bought were pretty broken up. If possible, try to buy a bag where they are in full slivers, this will make it much easier to decorate. The Table: although this isn’t a food item, I do think the table is important. I got most of our decorations at HomeGoods—the gold flower mats that I used as a runner, the candles, and the glass holders. For my flowers, I bought some festive colored tulips and put them in mason jars. I filled the mason jars with cranberries to give them an extra festive look. 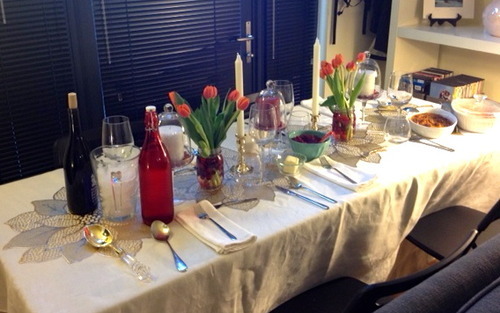 I made sure the flowers were colorful because otherwise, everything on my table was white. Hope you all had good Thanksgivings!